Four times as large as Corsica, Vancouver Island is inhabited mainly in the south, around Victoria. Otherwise, the island is almost entirely wild. The density of its forests, the huge size of its ancient trees, the scarcity of infrastructure and the wildlife that abounds make Vancouver Island almost one of the last wild places on the planet. Nearly 30,000 black bears still live there, that is an amazingly large population and they can often be spotted, even close to houses, sometimes looking for food. One can also see whales and orcas. And make a detour to Cathedral Grove, where the oldest trees in Canada can be seen, in a forest where we can no longer see the sky! We were on Vancouver Island this summer and went to Telegraph Cove where we took the trip to see the orcas. It was very good, we saw a few long killer whales at a distance so as not to disturb them (people in a canoe that lined the shore were really close because orcas were fishing and came close to them). We also saw a humpback whale and dolphin watching. A very nice trip! We have not made any trek to see grizzlies but we have seen black bears in the village, where fishermen left some salmon remains for them. To be sure to see the bears make sure to stay in Tofino. Tofino is a small village and a must see. One feels at the end of the world in a village with people who live very simply and are very close to nature. Some are descended from a line of Indians. 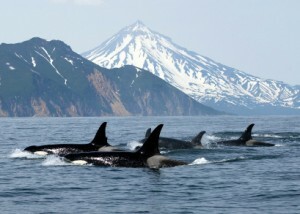 Worth also to go around in zodiac to see bears and whales and then with a little luck some orcas. We did a zodiac tour and we made a journey to several small islands and we saw some bears from very near, who were engaged in fishing. On the road to Tofino it is not bad to take a detour through Ucluelet and take the footpath that runs along the ocean. There are also on the road some parks with beautiful lakes and sequoia. Then also stop on Long Beach to watch the surfers. Then head off to see the humpback whales, but not many killer whales at this time of year unfortunately. The Vancouver Island has stunning scenery! For the best whale watching season come in March but there are always loners that remain around the island! Victoria is a place where you can go whale watching but it’s definitely worth a visit to the Butchart Gardens with its collection of roses, the Japanese garden, the small gardens of flowers and plants extraordinary staged by artificial waterfalls and fountains.